Two winners … Not just one. A camper entry and a staff entry. Too tough a decision to choose between them!! Congratulations to Julia, our camper, and David, our staff member!! And – a big THANK YOU to all who sent in an entry! More details coming on how you can order your hoodie with your choice of design. Thank you to our Alumni, Claudette, for the artistic rendering!! Can’t wait to see the actual hoodies. 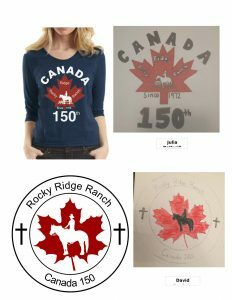 Claudette will be preparing each hoodie and will be using 100% made in Canada products. We are so delighted to use her services. Check out her website http://www.costaclassics.com/ One talented lady and a proud RRR Alumni (camper and staff).